There's this World Bank expert who said a million Malaysians today live abroad as a result of policies that favor the Malays. SatD the Malaysian blogger who has been part of the Malaysian diaspora for years, and who deals regularly with the World Bank, expertly rubbishes Mr Philip Schelleken's summation in his latest posting Cinatocracy (and a graph paints a thousand words). 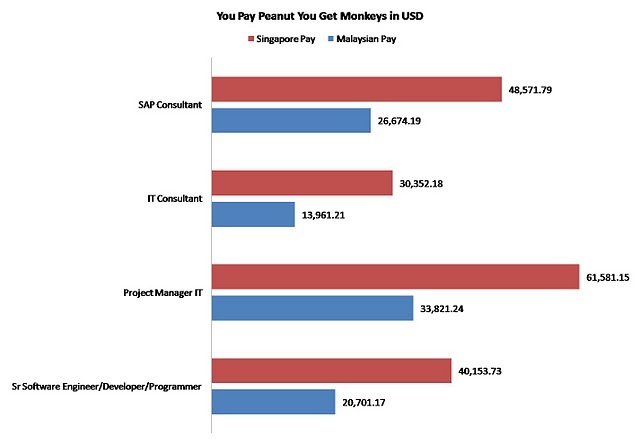 Apart from confirming what we already know (that institutions like the World Bank and the International Monetary Fund really know nothing about us and probably don't care), blogger SatD explains why a lot of Malaysian Chinese have gone to work/live in Singapore as expats. Yes, it is Singapore's own policy of drawing the Chinese to work and live in Chinese Singapore. It used to be just from Malaysia, now they are importing the Chinese from China. Hence, Cinatocracy. Even the Singaporeans have started to complain about this. If you want to agree or disagree with SatD, go to his blog HERE and tell him so. But study his graphs too (there are 15 altogether and by this time I think the World Bank is seriously scrutinizing each of them to verify its own shortcomings) and know that if you are reading this from KL or KK or anywhere else in Malaysia, the chances are you, regardless of race, are grossly UNDERPAID, man.